The Office of Her Excellency the Governor of the Cayman Islands in liaison with the Cayman Society of Architects, Surveyors and Engineers (CASE) and the Cayman Contractors Association (CCA) is now promoting the 2017 Governor’s Award for Design and Construction Excellence in the Cayman Islands which is to be made by the Governor to encourage, foster and maintain design innovation, sustainability and excellence in the Cayman Islands construction industry. Real Life | MC² and National Concrete. 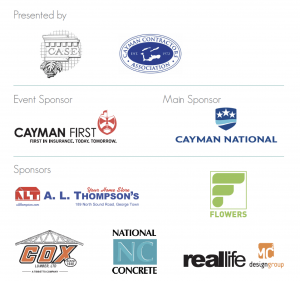 CASE is the Cayman Society of Architects, Surveyors & Engineers. The Society coordinates the professional development within the Design and Construction industries in the Cayman Islands. CASE’s main role is to advance the study of the Art and science of Architecture, Surveying and Engineering and allied professions in the Cayman Islands. Please visit us at www.casecayman.ky. The Cayman Contractors Association is a self-regulating body. It was formed in order to create uniform ethics for the construction industry; to provide assurance to potential clients that, if a CCA member was chosen to construct a project, the outcome would be successful. That standard continues today and CCA members, regardless of the size of their respective businesses, are regarded as Cayman’s most honourable contractors. Please visit us at www.CCA.ky.